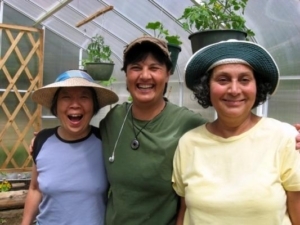 Everyone is welcome to jump-start the Gardening year in the community greenhouse. Soil making, seed planting, transplanting, knowledge sharing and general puttering in the warm greenhouse at the school are on the agenda. Ideas currently being explored involve: cuttings, propagation, and medicinals. Activities for the next Saturday session will be planting early starts and soil testing for PH. Bring some of your own soil samples! Please bring seeds to swap, and any extra seed trays you have. We are meeting on Wednesdays and Saturdays at 10 am at the Greenhouse behind the School. We’ll be sowing the fallow bed in rye and phacelia as cover crops. We’ll also be amending the soil, so please bring any organic material you can contribute: seaweed, compost, nettle stalks, leaves, compost tea, ash, lime, manures, grass clippings, cardboard, newspaper, etc. are all welcome! The Trading Post wasn’t able to give us any replacement tarps as they’ve changed the way they order and won’t have any to spare until at least the fall. Since the tarps break down in the summer sun anyway, and we’re getting near to the end of our wet season, I suggest we use cardboard to cover our piles until the fall and tarp then. As our tarps are NOT recyclable (I checked with GIRR) we’ll need to bag up any we remove. If you have any questions at all, just give me a shout. 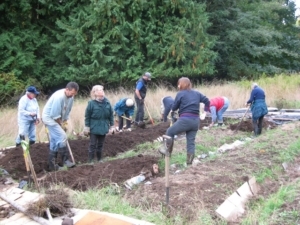 The 6th Annual Galiano Nettlefest Community Potluck will take place on March 30th. Stinging nettle (Urtica dioica) is a herbaceous flowering perennial, native to North America, Asia Europe, and northern Africa. The plant has long been used as a medicine and a vitamin-rich food source. It has a pleasant, grassy flavour, with a slightly metallic tang, similar to spinach. In spring, stinging nettle contains up to 25% protein, dry weight, which is high for a leafy green vegetable. After soaking or heating to remove the sting, the leaves can be dried, puréed, or substituted for spinach in any recipe. Nettle soup is a common use of the plant in northern and eastern Europe. Nettles grow 3-7 feet tall in the summer and die back in winter. They spread by seeds and runners. Nettles are considered invasive plants, but that also means they’re easy to find and easy to propagate. The plant grows quickly and attracts beneficial insects such as butterflies. It likes partial to full sun and is drought tolerant. 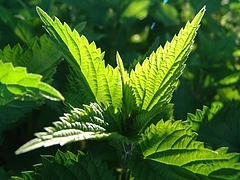 Nettles contain a lot of nitrogen, so they are used as a compost activator and to make liquid fertilizer. They are one of the few plants that can flourish in soils rich in poultry droppings.